Distribution, the last link of the supply chain, used to consist of work done for customers to get their goods to their nearest store. Not anymore. For the sake of greater convenience, e-commerce customers are open to taking on some work themselves on the final mile. With careful design, that labor can become a valuable part of their experience. With e-commerce continually decreasing the time between when you buy and when you receive your stuff, the default option for convenience is clearly digital shopping. The remaining benefits of physical stores reside in experience, particularly the social elements and the exploratory discovery and selection of “going shopping.” Retailers have stopped considering “showrooming” a threat and are instead trying to create powerfully branded spaces and experiences. Walk down the streets of Manhattan’s SoHo district, and you’ll see that luxury storefront real estate has been taken over by “click-brick-stores” such as TheRealReal, The Sill, and Casper. Online, direct-to-consumer e-tailers like Allbirds see the value in personal consultations and flagship stores. There’s very little for which people will trade away their cherished convenience. But to gain more convenience, we’re willing to do more. And doing more doesn’t feel like a burden when it feels like lifestyle (obsessively waiting for the next Yeezy drop), or community (with Glossier). In fact, consider Glossier, valued at $1.2 billion with 2018 revenue reported to be a little over $100 million, famed for its customer empowerment and connections. As a middle-aged dude, I am not a member of that community—just learned I’ve been pronouncing the G-word wrong—but it’s impossible for even me to miss the brand’s by-you, with-you, for-you ethos. There’s very little for which people will trade away their cherished convenience. But to gain more convenience, we’re willing to do more. While the most convenient option is the one that comes in a box to my home, that can make for a less resonant brand experience. Smart companies compensate for this with carefully designed unboxing rituals, and by creating strong stories. Everlane, for instance, lets us see inside their Chinese factory, and Yumi babyfood provides an incredibly elaborate unboxing experience, including a children’s book, literature that feels like a nutritional birth chart, and contact info for a “personal” Yumi rep.
Ikea pioneered a different way of buying furniture and housewares through multiple coordinated innovations. They completely separated the two functions of a retail store: a fulfillment warehouse and an experiential showroom (including a restaurant; meatball, anyone?). They articulated their own version of cheery Scandinavian modernism that cuts costs at every opportunity, while being designed for flat-pack. Customers get something that is affordable, convenient, and stylish. 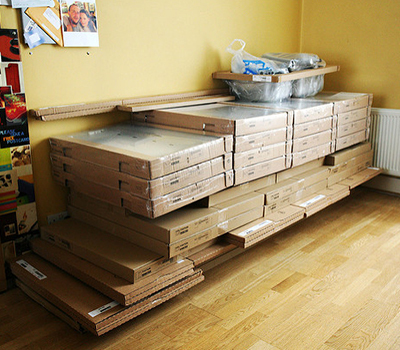 Flat-pack means that most of their stuff will fit in or on your car: this is the original same-day convenience. It also means that the furniture isn’t finished. This is both an opportunity and a challenge. Some DIY types love to hack IKEA merchandise, and can find extensive inspiration online. For them, assembly is a chance to personalize. Others feel nothing but dread at the thought of a day with an Allen wrench. Ikea is there for them, too: They acquired TaskRabbit in 2017, adding up to 60,000 potential furniture assemblers to their system. If you had told me in 2011 that within five years there would be companies—brand-new orgs that didn’t then exist—selling $500 million worth of mattresses over the internet… well, I would have told you to go lie down. Because they are so bulky to ship and return, and because you might like to try out a bed before buying it, mattresses seemed like the least suitable category for digital-native disruption. In fact, that has happened. Why? If you can meet customers’ expectations around convenience, offer free returns, and include a guarantee, the old precautions disappear. If you can meet customers’ expectations around convenience, offer free returns, and include a guarantee, the old precautions disappear. Accelerating this trend, the new foam mattresses are made of mostly air, so they can be compressed and vacuum-sealed to ship in compact boxes. These “unbox” with a dramatic puffing up to size that is as magical as your childhood memory of Grow Monsters, which admittedly may be not very magical. These compressed mattresses offer the same benefits as flat-pack (without the need for a TaskRabbit). And because you can’t try out your various options first, these direct-to-consumer companies lessen your anxiety of choosing by selling only two or three models. The same logic also reduces the risk of buying in mass quantities: at Costco, their strong house brand and carefully limited selection (only 4,000 SKUs) make it less stressful, and makes a lot of operational sense in other ways, but that is a different article. As e-commerce’s promises of convenience become the baseline expectation, new behaviors and business opportunities are emerging. (Shipping giant plants, anyone?) Digitally native companies are overcoming the challenges that seem more daunting to digital immigrants. Customers must be engaged in different ways. The surprise is how much that engagement includes their voluntary effort. As HBR pointed out just last week week, manufacturers who serve retailers suffer from a lack of direct customer understanding, resulting in costly misalignment (both stockouts and returns) between what you make and what customers buy. This post offers smart advice to which we at EPAM Continuum would add our own: get to know your customers. You’d be surprised at what they’ll do for brands they love.